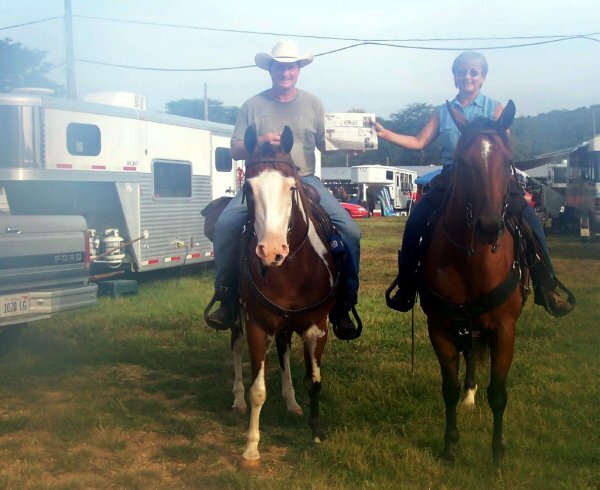 The Quill traveled to Eminence, MO with Todd and Carol Stevens and their three horses on their 10th consecutive year of trail riding there. The Stevens are from La Harpe and enjoy riding the trails of the Cross Country Trail Ride, visiting friends, the nightly BBQs, dances, and Nashville star entertainment as well as cooling off in the Jack Fork and Current Rivers. They camped for 10 days in their horse trailer along the river along with several thousand others.\~They are looking forward to the next time vacationing and riding in the hills of southern Missouri! s see where all the Quill can go.